Since the first laptop was released, the race has been on to make smaller and more portable devices. However, as computers have become more and more reduced in size, users have realized that smaller is not always better. The size of a laptop screen directly affects its portability and its functionality. Large screens can display more, but are less portable. Smaller screens, on the other hand, make for highly portable laptops but can interfere with your viewing experience. 14 inch laptops hit the middle ground head-on. These laptops are a great choice for those who need portability but don’t want to sacrifice too much of their display. Screens of this size are large enough to adequately display many kinds of application. They aren’t perfect for every purpose, but they cover the bases for most. We’ve gathered feedback from users and tech experts to find out what makes a fantastic 14 inch laptop. Based on this analysis, we compiled a list of the Top 5 best 14 inch laptops on the market. Our analysis included a careful look at what features go into a great 14 inch laptop. Users reported a wide variety of considerations to go along with a wide variety of use cases. However, five criteria stood out above the rest. These criteria are important for most users of 14 inch laptops, whether the device is being used for work, study, or play. We determined this final list by looking at which features were listed as highly desirable for 14 inch laptop owners across use cases. There are many important features to consider when choosing a good laptop. Which feature is the most important will depend in part on your particular needs and intended use. However, when it comes to 14 inch laptops, one consideration that is of particular importance to users is the display. You may have sacrificed some screen size to get a more portable laptop, but that doesn’t mean that you have to sacrifice quality or overall functionality. Some smaller laptops come with less than stellar displays. Lower resolutions deliver a less satisfying viewing experience and can be frustrating for some users. We recommend choosing a laptop with at least a Full HD display to get the most out of your 14 inch laptop. Choosing a good CPU is another vital factor in finding the right laptop. Insufficient processing power can lead to lag, slow-downs, and loss of productivity. If your CPU can’t keep up with your demands, using your laptop can be an exasperating experience. It’s important to choose a laptop with enough processing power to meet your needs. What kind of CPU you need is dependent on what you plan to use your laptop for. The Intel i-series processors consistently outperform the competition, and we recommend going with one of these. An i5 is a good place to start. If you plan to push your laptop with heavy programs or serious multitasking, we recommend an i7. Good processing power means more than just a good CPU. How much RAM your machine comes with plays a direct role in how quickly and efficiently you are able to run programs and multitask. Without sufficient RAM, you’ll be dealing with lag regardless of how good your CPU is. So just how much RAM do you need? We recommend not less than 4 GB. Some users might get away with as little as 2 depending on use, however 4 GB or better will support you through a wider variety of scenarios and help to prevent frustration should your needs increase in the future. If you’re in the market for a 14 inch laptop, chances are that portability is important to you. However, screen size isn’t the only consideration when it comes to portability. Weight can have as much to do with how well your laptop travels. As with screen size, choosing a lighter laptop can sometimes mean a trade-off. A lighter laptop may also be lighter on features, so how heavy you’re willing to go will be tied into what you plan to use it for. In general, anything over 8 pounds is going to impact portability, and we recommend trying to keep it under 5 if possible. However, you may wish go a little heavier in return for some awesome hardware. Whatever you choose, the key is avoiding unnecessary weight by choosing a streamlined device with a proven track record that doesn’t cut corners. Battery life is another important portability feature to consider when choosing a 14 inch laptop. A long battery life means more time spent focusing on what you do and less looking for a place to plug in. It also means that you can spend more time in places that don’t have power, an important consideration if you use your laptop outdoors. Laptops these days have a wide range when it comes to battery life. Depending on how you use your machine, some may last as little as two hours while others last over twelve. We recommend choosing a laptop that will give you at least four hours before you need to recharge. Based on our five criteria, the #1 Pick for best 14 inch laptop is the Razer Blade 14″ . This laptop won the top spot based on a brilliant LED-lit 3200 x 1800 QHD+ display. This device provides impressive clarity and color accuracy for a superior viewing experience. But a great display isn’t all that the Blade has to offer. This device is also packed with an Intel i7 CPU and 16 GB of RAM, an excellent amount of processing power for a laptop of this size. In terms of portability, the Razer weighs in at just under 4.5 pounds. While it certainly isn’t the lightest laptop on the market, this is still highly portable and a great weight for all that the laptop has to offer. The Razer Blade’s battery life is around 5 hours. This is less than we’d like to see, but not short enough to knock this laptop out of its well-earned spot as our #1 Pick. Coming in at a close second is the Lenovo ThinkPad X1 Carbon. The X1 Carbon doesn’t quite beat out the Razer Blade in terms of display quality, but it comes pretty close. This laptop has a WQHD display at 2560 x 1440 pixels. Users report a high degree of satisfaction with the fantastic image quality on the Carbon’s screen. Like the Razer Blade, the X1 keeps you moving with an i7 CPU. It has 8GB of RAM, less than our top pick but still excellent for most purposes. Portability is where the Carbon really shines. This laptop weighs in at just 2.8 pounds. Battery life clocks in at up to 9 hours, potentially giving you a full workday before you need to recharge. Overall, the X1 Carbon is an excellent choice of laptop. It came in second due to the Razer Blade’s superior display and processing power, but it was a close race between these two highly functional laptops. Coming in at third place is the MSI GS40 Phantom. As a gaming laptop, this device has a lot to offer to anyone who runs heavy applications. The Phantom has a screen resolution of 1920 x 1080. The HD display is non-reflective so you don’t have to worry about interference from other lighting sources. As with the Razer Blade, processing power is a major strength for the MSI Phantom. This laptop comes with an Intel i7 CPU, one of the most powerful on the market. It also has 16 GB of RAM. Thanks largely to some great hardware, users report that the Phantom performs well under pressure, keeping up to speed under the demands of many use cases. How much power any laptop consumes is directly dependent on how hard you push it, and the MSI Phantom is no exception. With heavy gaming use, the battery on this machine can run as little as two hours. However, for less intensive activities you should be able to get 4+ hours of power before you need to plug in. The GS40 is nicely portable at 3.75 lbs. This is well under our recommended maximum and shouldn’t feel heavy to most users. The MSI GS40 Phantom is an excellent laptop for high-demand users. Although it placed third on our list due to a shorter battery life, it’s still a fantastic choice—especially if gaming is your top priority. When it comes to 14 inch laptops, we couldn’t help but include two from Lenovo. The Lenovo IdeaPad is the fourth place contender on our list. 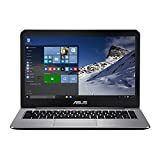 This laptop is another great choice for those who don’t need quite as much as processing power as the MSI Phantom or the Razer Blade, but still want an excellent 14 inch laptop. The IdeaPad offers a Full HD LED-lit display for a clean viewing experience. Although it has less processing power than some of the other laptops on our list, it’s still a fast machine with an Intel i5 processor and 8GB of RAM. At 3.7 pounds this laptop is also highly portable. With up to 6 hours of battery life, you should be able to get plenty of work in before you need to find a place to charge. Overall, the Lenovo IdeaPad is a great 14 inch laptop. If you need a laptop for medium-use scenarios, the IdeaPad offers a great display, plenty of processing power, and great portability at a reasonable price. However, it came in fourth on our list because other laptops in our Top 5 have more processing power. Our fifth place winner is the ASUS VivoBook. 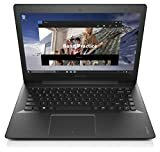 This laptop is an excellent choice for users on a budget, offering exceptional value for its price. A Full HD 1080 pixel display comes in matte to help you avoid distracting reflections or glare. The VivoBook offers less processing power than our other devices. It has 4 GB of RAM and runs on an Intel Quad-Core N3700 processor. This is not as powerful as the i5 or i7 processors found in the other laptops on our list. However, it’s an efficient processor that is well-suited to certain situations. In fact, if you plan to use your laptop primarily for low intensity tasks like web surfing or text editing, this processor offers some distinct advantages. It’s quite a bit cheaper, which can be a big consideration if you’re on a tight budget, and it requires less energy, which is better for your battery life. The battery on the VivoBook is fantastic, lasting up to 12 hours before a charge is needed. It also weighs in at 3.3 lbs and is just 0.7 inches slim. If portability is your top priority, this laptop is well worth considering. However, it placed last on our list because of reduced processing power when compared to our other four laptops. If you need more budget options and don’t mind considering other screen sizes, check out our list of the best laptops under $600. The Razer Blade won the top spot as our #1 Pick for Best 14 Inch Laptop. This laptop won out over the others primarily because of its excellent display and powerful processing capabilities. A number of features go into a great 14 inch laptop, and we’ve hit the most important ones here. While the Razer Blade is definitely #1 on our list, the other four laptops measure up across each of these criteria. Each is worth consideration when choosing a good laptop, and each one has individual strengths to offer. How you intend to use your laptop will play a large part in determining which one best fits your personal situation. While we stand by our #1 Pick, we recommend giving each of our Top 5 a close look. We've done extensive research to determine the best 14 inch laptop in 2016. We compare the top 5 and choose an outright winner.